I had an exceedingly ridiculous day replete with a car that died in a parking lot, a blackberry that kept crashing (but who cares, its days are numbered – iphone 4s is fine for now – they should have just called it a 5 – BTW), an iPad that kept dropping service, a cancelled meeting and yadayadayada. So I figured, hey, Y Kvetch! I love this license plate. I saw it in a parking lot yesterday and laughed out loud. I always wonder, what drives someone to drive something with a plate like this? 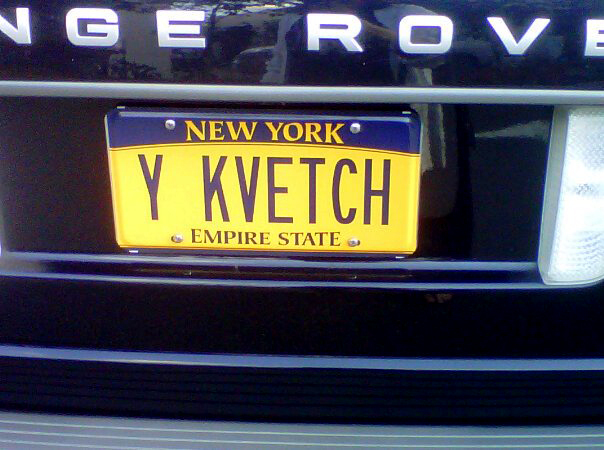 Perhaps the owner of a Ranger Rover has nothing to kvetch about. But seriously, kvetching knows no socio-economic boundaries. And many times those with the most abundant lives have the most robust habit of kvetching. So, after a day of nothing more than surface aggravation, albeit more than a usual day should have, the Y Kvetch sentiment fit the bill. Hey, maybe we should start a movement. kvetch/k(ə)veCH/Noun: A person who complains a great deal. Verb: Complain. Haha. Would you REALLY drive around with those? If you like what the plate means and you want to by it from the license plate owner, you can run a license plate search and do a reverse license plate lookup at licenseplate.net to find the owner to contact them. USRECORDSEARCH.COM performs a licenseplatelookup. At US Record Search, click on licenseplatesearch. You can also trace a plate to see who the owner of the plate is so you can contact them to report someone’s driving, such as their kids or employee.